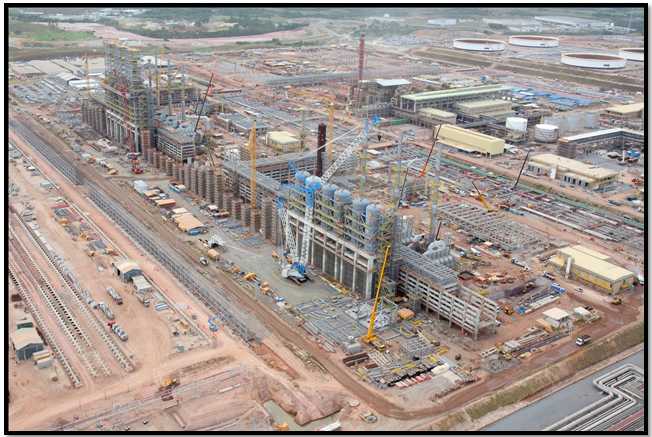 Project Data – Implementation of Delayed Coke Units and Regenerative Caustic Treatment at Abreu e Lima Refinery in Ipojuca-PE / Brazil. Considered by Petrobras the most modern refinery built in national territory, with capacity to process 240 thousand oil barrels per day. Camargo Corrêa is a company known in the market for having innovation and technology as trademarks in their projects. The 4D Planning is nowadays a reality practiced by many engineering and construction companies and we may not ignore the fact that this process provides gains in the timetable, costs and quality. The RNEST project involves the major national and international construction companies. 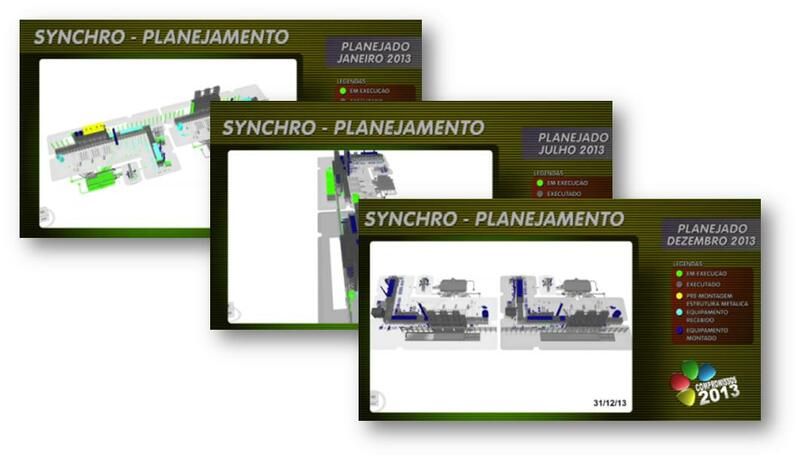 Since 2010 the 4D Planning processes implemented using Synchro PRO, have obtained very interesting results, in this article we will approach their contribution in all project phases. Due to the release of the detailed design that is responsibility of the employer company (PETROBRAS), one of the major problems that the company faced was the difficulty in elaborating correctly the planning along the time period. 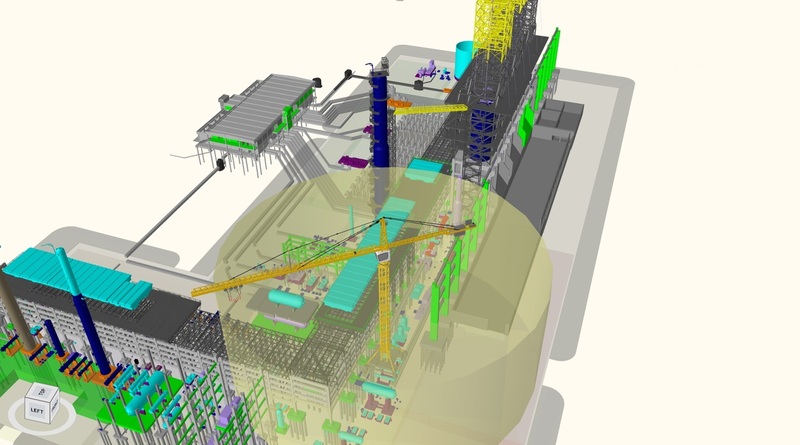 The implementation of a 4D system assisted in the visualization of the executive sequence, enabling an interaction with all construction stages performing planning simulations and deviation follow-up. Executive Sequence – A regular monthly schedule of the services (visualizing one month ahead) was developed using Synchro Pro, with the purpose of enabling a better view of the execution plan (timetable) by the Construction team, and consequently facilitate monitoring and control of such activities by the Planning and Control team. With this one month look ahead visualization, it is possible to identify in advance, potential interferences and this way treat them before they become a delay in the timetable. Executive methodology and their predecessors. The capacity to view the project, considerably improved the communication quality and collaboration between the interested parties through the creation of a shared view. With the availability of a free viewer (Synchro Open Viewer), all of those involved in the project share the information which is updated weekly and made available in the shared server, enabling the updated files to be viewed at any time. The pipeline execution in the project is on the critical path in the schedule due to its quantity and execution complexity. Therefore, it was necessary to obtain a facilitator in order to avoid greater difficulties, increasing the assertiveness and reducing the possibility of impacts in the timetable. The 3D Status contemplates information of different project areas, the involvement of the areas was fundamental to generate a product that enables us to take actions and improve the results using Synchro in other processes, linking not only to the timetable. Planning – performs the programming by identifying the best opportunities for fabrication and assemblage. 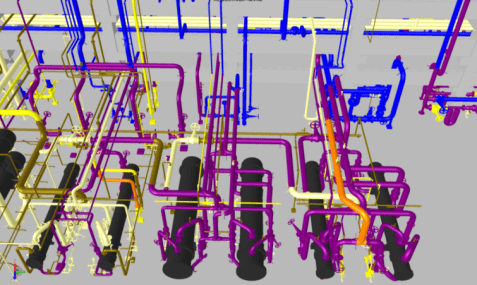 Pipe-shop – views the executive sequence and fabrication needs, allowing prioritizing the Production necessities. Production – views the status of the Spools and resources necessary for their assemblage. Quality – views in which status the Spool is, necessity of reports and progress. Measurement – views if the Spool is released for measurement and also to guide the quality for the progress of reports necessary. 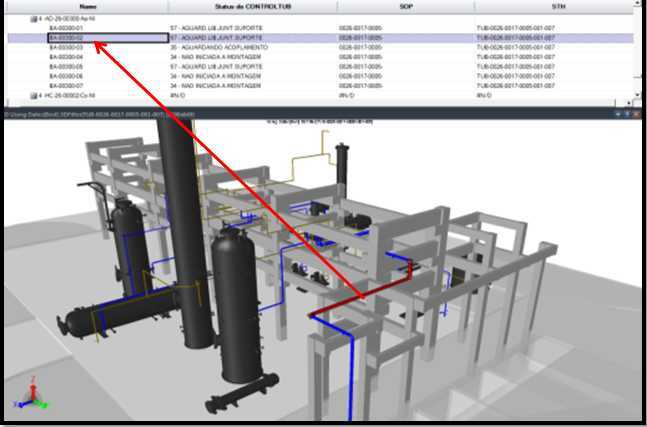 Fabrication – with status identification using colors, we can identify and guide the Pipe-Shop and quickly disclose lists of priorities for the fabrication, optimizing the flow and all costs involved. Programming – increase from 70% to 95% of schedule assertiveness, because once the spools are divided in the model, we may view the interferences simultaneously of several disciplines, providing a reliable assemblage sequence. This way we may accomplish all goals and avoid deviations. Assemblage – with Synchro PRO, we are able to identify possible interferences, necessary resources and new assemblage possibilities, while previously the information was only possible by on-site visitation. Nowadays we may manage quickly and comprehensively within the program. With the possession of the programming in 3D images, we reduce the strategy development time for programming execution, once the visual effect elucidates instantaneously. With the integration, it was possible to centralize all information necessary for the Commissioning in a quick and visual form. The model enables us to view simultaneously several disciplines and we provide a sequence for all the involved, identify possible interferences and necessary resources. Previously identifying only on site, now we are able to manage quickly and comprehensively within Synchro PRO, this way the analysis and execution time for the activities was reduced. With the integration, it is possible with the model to access external systems, with this access it is much easier to understand the process, once it is possible with these links to view the project in 2D, access web pages, photos, catalogs or any other information linked to the registration Tag. With the purpose of optimization and interaction between systems, there are several conversations to add new functionalities, develop an interface between the BIM model, SAP and the Palm used in the work fronts, automating the updating process of timetable updating and other controls. How was the BIM Experience in the project? Reality Simulation: Does it help to get an idea of the final product? Strategies for the implementation of BIM Teaching in Postgraduate Studies. Experience at the Polytechnic University of Madrid.